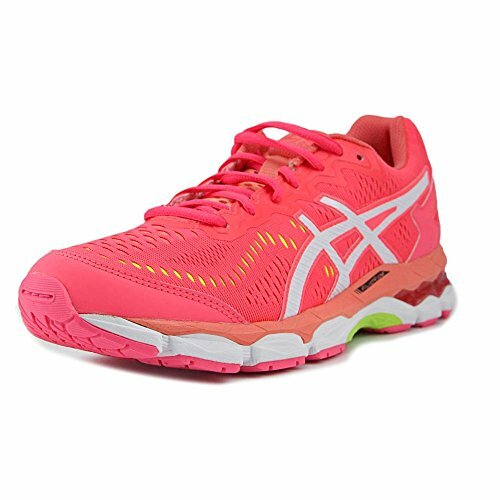 The popular adults running shoe has made its way to kid feet with the ASICS® Kids Gel-Kayano 23 GS! This brand is a member of the Sustainable Apparel Coalition. FluidFit™ upper features a stretch mesh with synthetic overlays for a sock-like fit. Lace-up closure gives a snug, adjustable wear. Plush tongue and collar offers a supportive wear against foot. Mesh lining creates a breathable wear in shoe. ComforDry™ X-40 sockliner controls moisture and has anti-microbial properties to create a healthy foot environment. I.G.S® (Impact Guidance System) helps make your child's stride comfortable from the first step on. FluidRide® midsole returns energy and offers cushion for longer lasting play. Rearfoot and forefoot GEL® cushioning help with shock absorption. Dynamic DuoMax® Support System delivers stability on the playground and gym. Combination of GEL and FlyteFoam™ technologies gives a lighter feel. Guidance Trusstic System® works with Guidance Line® vertical flex groove for a smoother ride. ComforDry Lasting is breathable and helps with moisture management. Imported. Measurements: Weight: 10 oz Product measurements were taken using size 7 Big Kid, width M. Please note that measurements may vary by size. The popular adults running shoe has made its way to kid feet with the ASICS® Kids Gel-Kayano 23 GS! FluidFit™ upper features a stretch mesh with synthetic overlays for a sock-like fit. Lace-up closure gives a snug, adjustable wear.